Schedule Performance Index (SPI) and Cost Performance Index (CPI) are Earned Value Management (EVM) measures for project schedule and cost efficiency respectively. SPI and CPI are used to assess the magnitude (or amount) of variation from the established schedule and cost baselines. These are basic EVM concepts in project management that every project manager and PMP aspirant needs to know well. You can expect to see about 10 questions on your PMP exam around EVM concepts. I have several posts covering EVM on this blog. Make sure to read those as well. According to the PMBOK® Guide, the schedule performance index (SPI) is a measure of schedule efficiency on a project and is expressed as the ratio of Earned Value (EV) to Planned Value (PV). It is used to measure how efficiently the project team is using the time on the project. SV is expressed in dollar value and we’ll review it in another post. Let’s focus on Schedule Performance Index in this post. How could we express schedule in monetary terms? It took me a while to grasp these concepts. If you are unclear about these concepts too, I suggest you read Planned Value, Earned Value, and Actual Cost before you go further. The formula for SPI is really simple. Remember that Earned Value goes on the top (numerator) and Planned Value goes to the bottom (denominator). I have a little trick on my PMP Mnemonics page to help remember the SPI and CPI formulas correctly. As you can see, SPI is a ratio of 2 numbers. A ratio doesn’t have any units. It’s just a number. This would happen when the Earned Value is equal to the Planned Value. It indicates that the project is right on schedule. This would happen when the Earned Value is less than the Planned Value. It indicates that the project is behind schedule (an unfavorable condition). The lower the value of SPI, the farther the project is from the schedule baseline. Note that since the Earned Value cannot be negative, the minimum SPI value is 0. This would happen when the Earned Value is more than the Planned Value. It indicates that the project is ahead of schedule (an favorable condition). In essence, SPI is an indication of how far we are from the schedule baseline. This will become clear when we look at examples next. I always like to use my favorite example of the boundary wall project to illustrate the calculation of SPI here and CPI later. So, here it is again. Alex is assigned as a project manager for a multi-hundred dollar project! The project involves constructing a boundary wall around a square piece of land. The planned cost for each side is $1000 and it’s estimated to take one week to construct each side. At the end of week 1, the project team completed only 80% of the first side. What is the Schedule Performance Index of the project after week 1? What is the value of the work that was planned to be completed after week 1? We planned to complete one side each week. The cost of constructing each side is $1000. So the value of work planned to be completed after week 1 is $1000. What is the value of the work that was actually completed? This is the trickier part. The estimated value of the work for the first side was $1000, but we completed only 80% of that side. So, we accomplished 80% of $1000, which is 0.8 times $1000, or $800. $800 is the Earned Value after week 1. In other words, we accomplished or earned $800 of work after week 1. SPI is less than 1 after week 1. As mentioned above, if SPI is less than 1, it indicates that the project is behind schedule, which indeed is the case. Armed with this information, Alex discusses the situation with his project team and devises a plan to bring the project back on schedule. Now let’s take the same example forward. After week 2, the project team has completed 100% of side 1, 60% of side 2, 20% of side 3. What is the Schedule Performance Index of the project after week 2? What’s the planned value after week 2? The team had planned to complete 2 sides by week 2. Value of each side is $1000. Therefore, value of 2 sides is $2000. That’s our planned value after week 2. What is the Earned Value after week 2? 100% of side 1 is worth $1000. 60% of side 2 is worth 0.6 times $1000, or $600. 20% of side 3 is worth 0.2 times $1000, or $200. Adding all three, we get the Earned Value as $1800. Wow, we are almost on par with the schedule performance now. So, the corrective actions taken by the project team seem to have raised the SPI from 0.8 to 0.9. This is a positive improvement because we are getting closer to the target value of 1. According to the PMBOK® Guide, the cost performance index (CPI) is a measure of the cost efficiency of budgeted resources, expressed as a ratio of Earned Value (EV) to Actual Cost (AC). CPI is considered the most critical EVM metric and measures the cost efficiency for the work completed. CV will be covered in another post. Similar to SPI, CPI is also a ratio of 2 numbers and doesn’t have any units. This would happen when the Earned Value is equal to the Actual Cost. It indicates that the project is right on budget. In other words, it has spent exactly what was budgeted till date. This would happen when the Earned Value is less than the Actual Cost or put the other way, Actual Cost is more than Earned Value. It indicates that the project is over budget (an unfavorable condition). In other words, the value of work we are accomplishing is less than the amount we have spent. The lower the value of CPI, the farther the project is from the cost baseline. Note that since the Earned Value cannot be negative, the minimum CPI value is 0. This would happen when the Earned Value is more than the Actual Cost. It indicates that the project is under budget (an favorable condition). In other words, the value of work accomplished is more than the amount we have spent. Let’s extend our boundary wall example further to incorporate cost performance into the equation and see how CPI is calculated. At the end of week 1, the project team completed only 80% of the first side. But they spent $1200 on it. What is the Cost Performance Index of the project after week 1? What is the Earned Value after week 1? We calculated EV above in the SPI section and it is $800. What is the Actual Cost after week 1? Actual Cost is the money spent by the project team in week 1 and that is $1200. We had calculated SPI after week 1 as 0.8, which was unfavorable. But the CPI came out to be 0.66, which is even worse. It indicates that $0.66 of work is accomplished for every $1 spent on the project. After week 2, the project team has completed 100% of side 1, 60% of side 2, 20% of side 3. The amount spent by the end of week 2 is $3000. What is the Cost Performance Index at the end of week 2? Earned value at the end of week 2 is $1800 (calculate above under SPI Solution 2). Actual cost at the end of week 2 is $3000. Ouch! The project cost performance has dipped further. How did that happen? As it turned out, in order to catch up on the schedule, the project manager hired more resources. This resulted in additional cost and caused the cost performance to dip further from 0.66 to 0.6. Now we are only accomplishing $0.6 of work for every $1 spent on the project. These simple examples were used only to illustrate the concepts. In the real world, the project manager would not simply hire additional resources, which were not budgeted, without going through the proper change management process. The project team should be measuring and monitoring the project performance throughout the project to ensure that it remains on track. Corrective and preventive actions are taken in timely manner. If at any point it becomes clear that the project would need additional time or budget, a change request would need to be raised to revise the project budget and/or schedule baseline. The request would be reviewed by appropriate stakeholders, and an impact analysis would be conducted before accepting/rejecting the change request. If the change request is approved, based on the impact the project budget, schedule baseline, and other baselines may be revised. Let’s recap the key points we learned so far, and a few additional notes. Earned value management encapsulates scope, schedule and cost performance in order to measure and forecast project performance. SPI is a measure of schedule efficiency and is measured as a ratio of Earned Value to Planned Value. CPI is a measure of cost efficiency and is measured as a ratio of Earned Value to Actual Cost. In both SPI and CPI formulas, Earned Value is at the top (numerator). CPI is considered as the most critical earned value measure, and is one of the most important concepts for the exam. SPI and CPI values of less than 1 are considered unfavorable and the values greater than 1 are considered favorable. 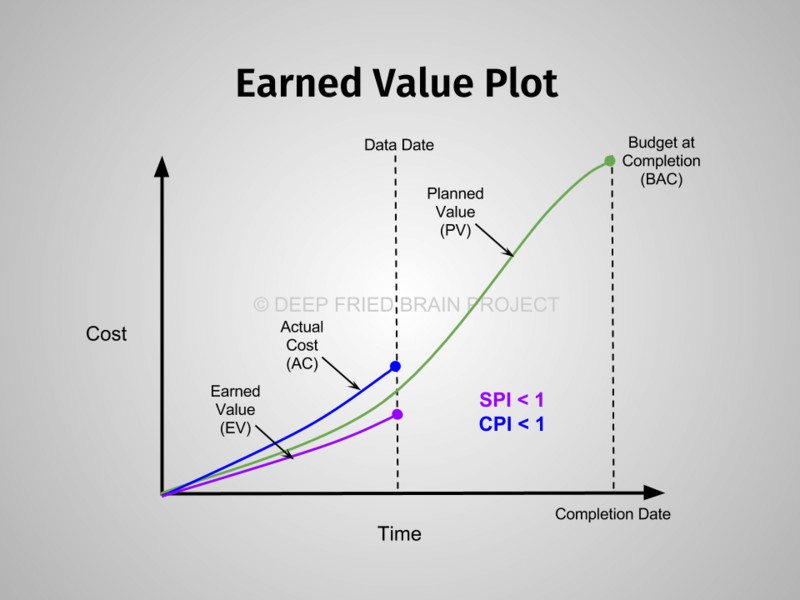 Earned value measures such SPI and CPI help to forecast future project performance. Earned values measures such as SPI, CPI, SV, and CV are termed as Work Performance Information. If you need more practice with formula based questions, try the PMP formula based sample questions on BrainBOK. In your key ‘Take Aways’ item 2. SPI is actually a measure of effectiveness rather than efficiency. The post is based on the PMBOK 6 and is correct.